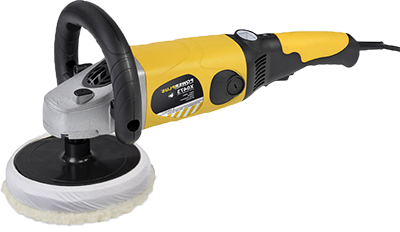 POWERPLUS Angle Polisher 1200W POWX0474: This high quality polisher features constant speed control and heat-treated precision-cut gear. All to ensure you of a smooth, stable and consistent operation. Because of the soft start the polishing product gets the chance to be fluently spread over the surface without wasting it. Polishing and buffing vehicles, boats and even sanding tasks are easily accomplished with this well balanced tool. You can quickly switch between sanding and polishing because of the hook & loop system. High quality accessories are included in this kit to get you started right away.